Are you on a business or leisure trip and need a comfortable accommodation? 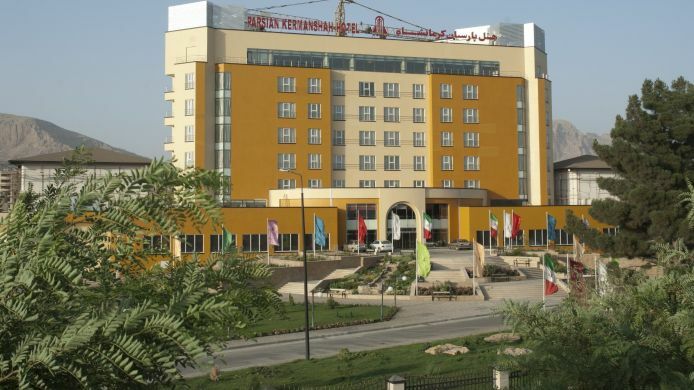 Then, welcome to the Parsian Hotel Kermanshah, a nice business hotel. Here, you sleep in spacious and tastefully furnished rooms that are comfortably equipped. A delicious breakfast buffet and the tasty dishes in the hotel restaurant ensure culinary satisfaction. Credit card guarantee is required to secure your reservation. The Hotel reserves the right to pre-authorize credit cards prior to arrival. Only cash payment in USD or EURO currency is accepted. In case of non-refundable bookings, guest’s credit cards will be charged before check in by hotel. Within easy reach of Shahid Ashrafi Esfahani Airport, the hotel is conveniently located in Kermanshah, capital of the eponymous province in western Iran. It is a good starting point for exploring the region. For example, visit the Taq-e Bostan, a series of large rock reliefs that can be found nearby, or taka a trip and admire the Behistun Inscription which is an hour’s drive from the hotel.